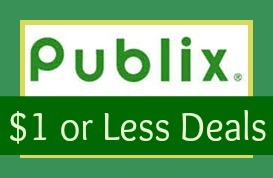 Here are all of the Publix deals available for $1 or less. My favorite deals are General Mills Cookies ‘N Creme cereal for 24¢, Crescent Rolls for 60¢, Del Monte Canned Vegetables for FREE, and Ragu pasta sauce for 19¢. Keep in mind that we will get all new printable coupons on 8/1. You can see the full Ad here.